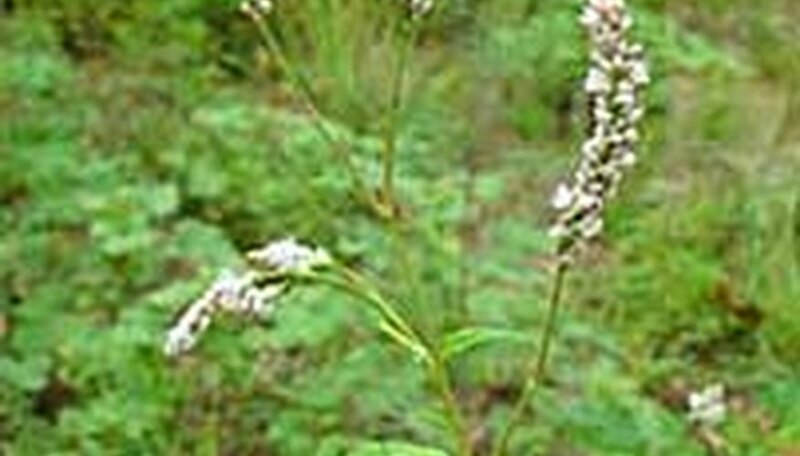 Polygonum hydropiper, or Smartweed, can grow as tall as 3 feet. At first, it creeps taller; but eventually the stem straightens out and it holds itself erect. Its leaves are lance-shaped and a bit wavy. The greenish pink flowers are delicate in nature, and tend to droop down. Like some other weeds, Smartweed is thought to have numerous homeopathic benefits, including helping with coughs, colds and amenorrhoea. Smartweed grows best in shady, moist areas. It can even live partially submerged in water. It is an annual, and reproduces by seed. Each plant can produce more than 3,000 seeds. If you wish to cultivate smartweed for its medicinal uses, you're in luck, because it isn't difficult to do: Simply plant seeds or transplant an entire plant in winter. Most people want to control smartweed. It is particularly damaging to crops, as it grows quickly and can wipe them out. In fact, farmers will often use fire to kill these plants. Even in small gardens, it does the same. Another problem is that it attracts plant-eating insects, such as the Japanese beetle. These insects will compound the problems caused by smartweed. You can pull these baby plants out, making sure to get all the roots. Use a fork to pry under it if you need to. If you are cutting off or pulling out mature plants, tie a plastic bag over the head to reduce reseeding. Many times the plants have been around for years. In this case, maintenance may be your best option. Each time a flower blooms, cut it off. This will reduce reseeding. If you have smartweed growing in a pond, a herbicide called Habitat can help. You may want to replace the weeds with other plants, though, so you can avoid oxygen depletion within the pond. For soil gardens, there are a wide variety of broad-spectrum and specific herbicides that will work on Smartweed. You can ask which one works best in your area at your local garden center. If you have a serious infestation, ask a professional about flaming the plants. Removing shade trees, as a last resort, will also help as it will expose the weeds to too much sun.